It seems that every day, more and more of your precious hard drive space is eaten away. Some of the reasons for this are obvious (like huge media files), but there are also unseen forces at play, like unused and temporary files, and even duplicate files that you aren't even aware of. You'd like to clear up some space, but you're worried about deleting something important! 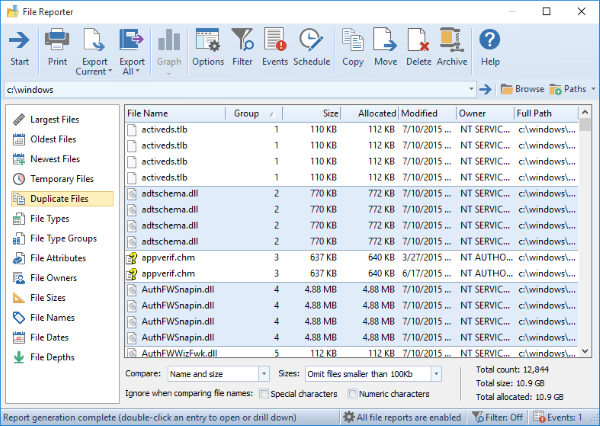 What you need is an effective way to manage disk space usage, one that begins with FolderSizes! 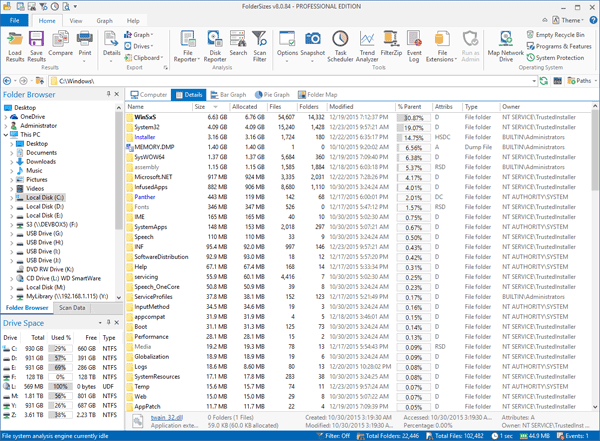 FolderSizes is different from other disk usage apps, because it offers a visual, intuitive way to instantly see what's taking up the most space on your drive! 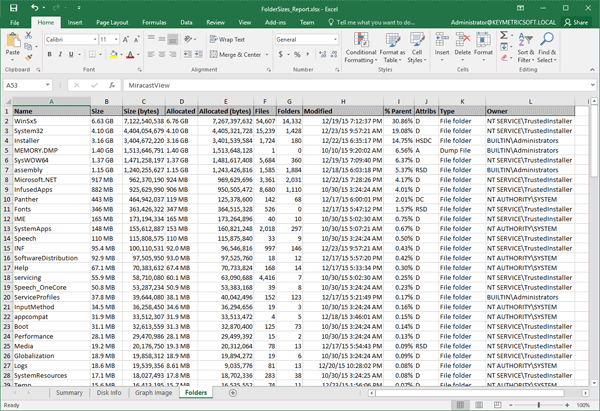 With FolderSizes, the most common culprits -- large files, old files, temporary files, and duplicates -- are quickly isolated for your review, letting you quickly reclaim hard drive space without risking deleting critical data. You can even view reports as bar charts, pie charts, and map graphs. 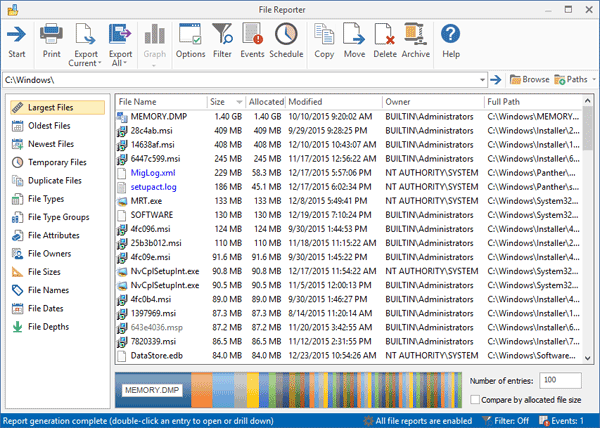 If you want a deeper level of analysis before housecleaning, FolderSizes gives you a multitude of options that allow you to filter scans by file name, date, owner name, and more -- imagine being able to isolate just how much space a specific network user is using! Or compare disk usage patterns from different points in time! The latest and greatest version of FolderSizes offers native 64-bit support enabling scalability -- enough to run scans on the hugest of networks with ease. Plus, you can now save multiple snapshots of file system analysis data to XML for later research and comparison. And as networks grow in size and complexity, FolderSizes has evolved to meet these challenges, with new support for analyzing multiple file system paths concurrently! 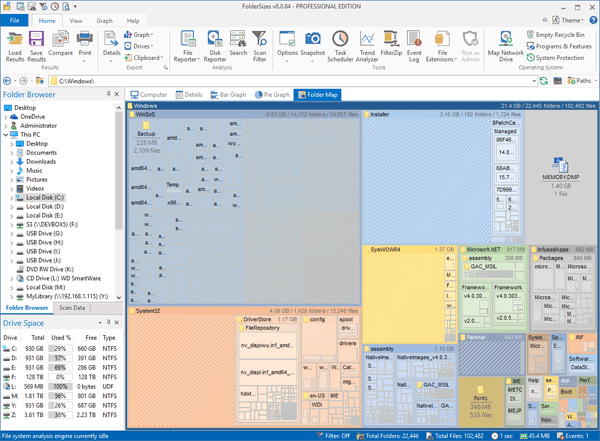 Visualize your disk space usage from a number of perspectives. Reclaim gigabytes of drive space, and improve your storage capacity planning. Manage and monitor disk space for network computers, portable drives and Windows servers. Calculated Date/Time Fields improve your ability to enforce proper retention and archiving policies. 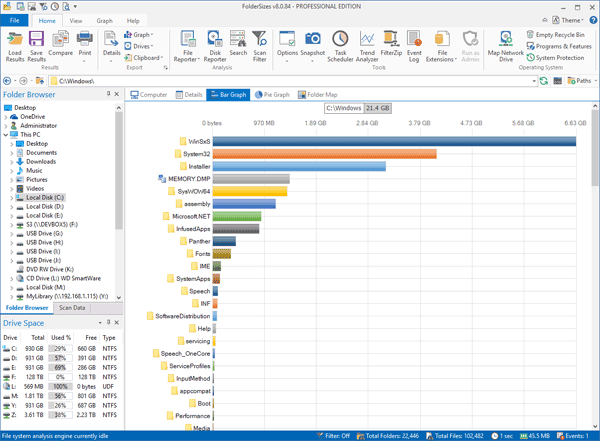 Utilize threaded file system analysis across multiple paths for huge performance gains. 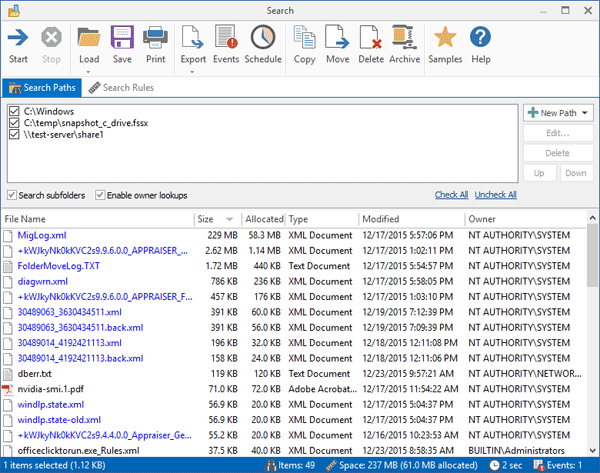 Re-load file system analysis data that has been previously saved in XML format. Handle XML files of nearly any size without undue memory strain. First 64-bit edition in its product class! Error reporting / event capture model with command line (save to file) support. The ability to delete, refresh, and update file system database entries. 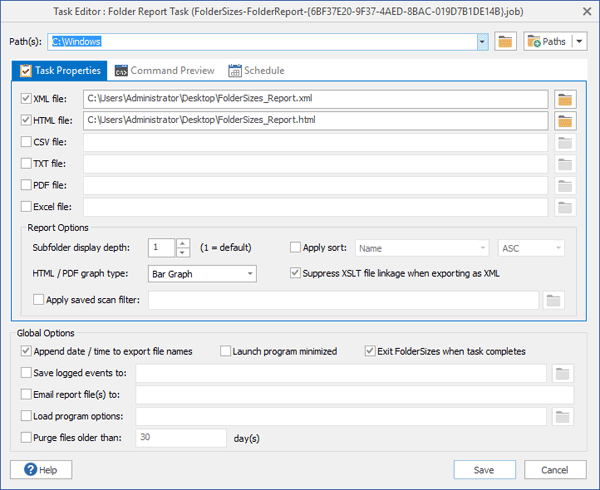 Improved XSLT file for rendering file system reports in XML format. After you purchase FolderSizes Professional Edition it may be used indefinitely. FolderSizes Professional Edition is licensed per user, so if more people are going to use FolderSizes Professional Edition you will need to purchase additional copies. Upgrades to future versions of the software will be free up to the next major version. For versions after that, upgrades will require additional payment, which will be discounted by 50%. It will be discounted only if you've purchased the last major version. Jeroen Heijster This promotion cannot be used to upgrade or extend an existing license. Key Metric Software Chris, the current release is v5.0.74. Stephen Brown How come I've seen a video of version 7 on You Tube? Are you selling an older version? I won't post the link becasue the video I saw was one showing ripped off software. Personally I wouldn't touch such things, but it did make me wonder why you are offering version 5 when there is a version 7? James Dennis Can we also get a FolderSizes Personal / Home License for 30% off? Key Metric Software James, please contact sales foldersizes.com and we'll see what we can do. Christian User Paypal payment is not accepted !!! Why??? Key Metric Software PayPal is indeed supported, but it's not showing up for some small percentage of users. We're working with our payment processing partner now to figure out why. But again, the vast majority of users will be able to purchase via PayPal if they so desire. Your payment processing partner is not very efficient ! You lose some purchasers !!! Bradley MacDonald I see the ad for 30% off on the above page - but when I click get the deal - there is no discount. Is there a problem? Constantin Florea @Bradley MacDonald, Please press the "Next" button once you arrive in the shopping cart. This will take you to the next page in the shopping cart where the discount will be visible. Bradley MacDonald Constantin - thank you - I did not think to move beyond the first page. It works - and has been purchased... Have a great day! Do we have packs (use for 3 pc for example) or lifetime licences ? A Window Into Your Hard Disk!